• Meet Society Socks, a sock company that plans on helping an overlooked problem of homelessness: the health of their feet. With every pair of socks sold, another pair of socks is donated to a homeless shelter. • It’s clear that to end homelessness, we need more than just good intentions. To read an article on how best to end homelessness, click here. In 2017, the National Alliance to End Homelessness reported that every night more than 500,000 Americans experience homelessness, representing roughly 17% of the population. Of these individuals, a 2016 study on homelessness reported nearly 2/3 will experience a foot health concern. These individuals must visit a medical professional, and often require follow up visits depending on the severity of their condition. These conditions are largely a result of poor foot hygiene, as homeless individuals are frequently found lacking clean socks and well-fitting shoes. While these individuals often report their foot concerns, Government and Charity financial support often prioritizes other health concerns such as mental health, dental problems and respiratory diseases. 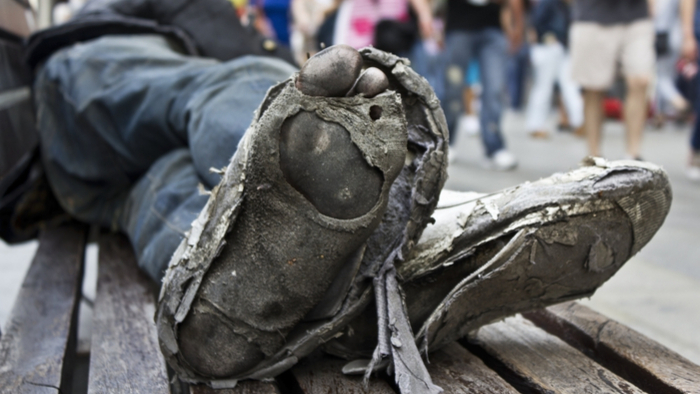 As homeless individuals’ foot conditions worsen, research has shown that they generally shy away from seeking treatment due to embarrassment of the condition of their feet. Analyzing the method in which shelters receive donations quickly uncovers where the problem lies. Interested in learning more about Homeless and Housing? Other readers at Giving Compass found the following articles helpful for impact giving related to Homeless and Housing. In addition to learning and connecting with others, taking action is a key step towards becoming an impact giver. If you are interested in giving with impact for Homeless and Housing take a look at these Giving Funds, Charitable Organizations or Projects.